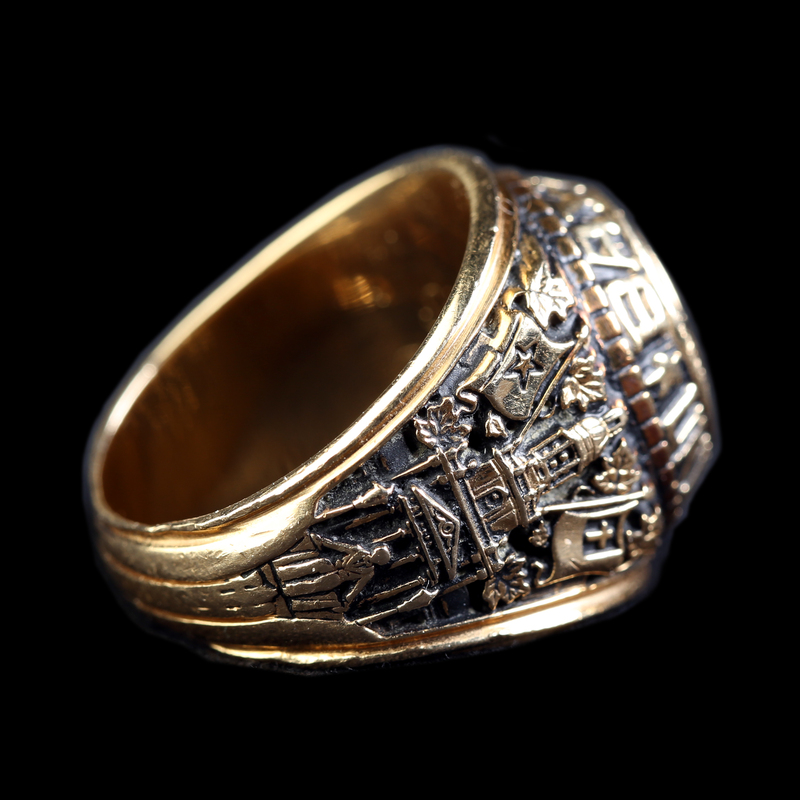 The Official Baylor Ring is the only ring bearing the symbols of Baylor University that will forever identify you as a member of the ring fellowship. 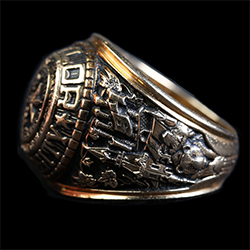 The ring showcases Baylor University's history and tradition. Do you remember the feeling you had the first time you stepped foot on campus? How about your first game day, with the storied Baylor Line and the mass of green and gold stretching the length of the gridiron, or the first time you saw Pat Neff Hall illuminated after a victory? These memories plus hundreds more are what make up your Baylor experience. The Official Baylor Ring is an everlasting symbol of your Baylor experience and your affiliation with other members of the Baylor family. Whenever it is worn, a lifelong link is established with the university and her graduates. The single-ring design was unveiled in September 1995. 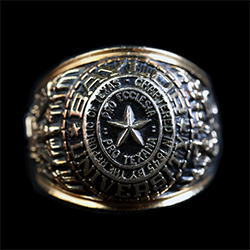 The one-ring concept was designed to honor Baylor graduates and bind them together with a symbol of history and tradition. The ring design remains unchanged. It is produced by Balfour and has 10 different Baylor symbols incorporated into the design. The bezel, or top of the ring, is a three-tiered Baylor seal. The focal point on the shank, or side of the ring, is Pat Neff Hall. Traditional symbols on the shank include the carillon of Pat Neff, the statue of Judge Baylor, the memorial lampposts, the Christian flag with a cross and Texas state flag. The focal point on the other shank is the towers in Burleson Quadrangle. Symbols on this shank include the columns from Independence, a bear, a memorial lamppost with plaque, and a railroad spike to honor the "Immortal Ten." 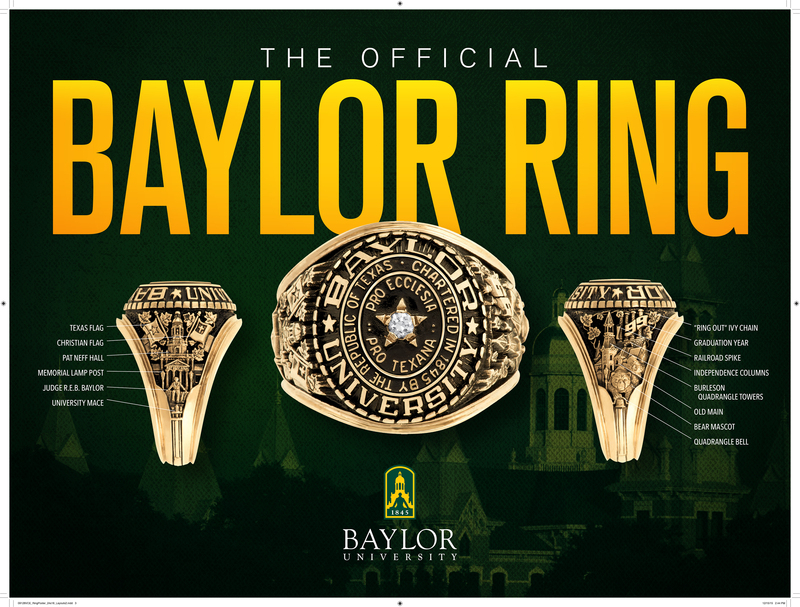 Both sides of the ring include strands of ivy to represent Baylor Ring Out. The Baylor Mace connects the two shanks at the bottom of the ring, and the inscription "Sic'em Bears" is inscribed inside each ring. Any former Baylor graduate may order a ring. The cost of the rings varies depending on size and quality of gold. The rings are available in 10K, 14K and 18K gold. A diamond or cubic zirconia may be added for an additional cost.